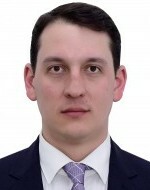 Ruslan Baimishev graduated as a legal consultant from Femida Legal Academy in 2006. In 2012, he gained a qualification in the Kazakh National Technical University in Geology and Exploratory Surveys. From 2008, he worked as the Deputy Head of KazGeoInform, the National Centre for Geological Information under the Committee for Geology and Subsoil Use at the Ministry of Energy and Natural Resources, which subsequently was renamed the Ministry of Industry and Innovative Technologies. On 25 October 2013, he was appointed Head of KazGeoInform. In 2011-13, he worked as a coordinator on the Kazakh-Finnish project, 'Development and improvement of the system in the geological sector in Central Asia'. In 2013, he studied the best practices of subsoil use rights and information technologies in Western Australia. Since 2013, he has been National Coordinator and Head of the Secretariat for the Extractive Industries Transparency Initiative in Kazakhstan. Since 2016, he has served as Director of the Subsoil Use Management Department of the Ministry of Investment and Development of the Republic of Kazakhstan. On the Code of the Republic of Kazakhstan" On Subsoil and Subsoil Use”.